E40/E27 LED Corn Bulb is replacement light or retrofit lamps for HID, HPS, Incandescent and CFL light fixtures. And E40/E27 LED Corn light is a reliable and economical retrofit replacement lighting solution. You can use them for post top lights, street lights, wall packs, security lighting and highbay light. Also We design our LED corn bulb with a 360 degree beam angle for both indoor and outdoor applications. Our led corn light can replace up to a 400-500W Metal Halide,HID and HPS. The socket can be E26 (US Medium),E27 (Europe Standard), E39 (US Mogul) or E40 (Europe Goliath) electrical lamp bases. For E40/E27 lights, whether for an indoor warehouse or outdoor parking, you can invest in a LED corn lights solution from AIS. As we can see,now innovative LED lighting technology is already taking over metal halide lamps,HPS and HID. And LED lighting has proven to be reliable, versatile and energy efficient. When you retrofit an enclosed fixture, you can review our E27/E40 LED corn lamp dimensions. This will help you to confirm the lamp has enough space for heat dissipation. Doing this will ensure lumen maintenance and extend its working life. Normally,as our LED corn light can fix the fixture well as they are not big. When you use LED corn bulb in outdoor fixtures, you can choose the corn lamp which is waterproof (IP65). Also,please remember to disconnect or bypass the ballast in the existing fixture when installing E40 LED corn bulb or E27 LED corn light. Our outdoor LED corn lamp can withstand a variety of weather conditions including high winds, rain, and freezing temperatures. Our LED corn lights also can perform over long distances from the actual bulbs to the field’s surface. We design the LED corn lighting to address the varied lighting requirements for indoor and outdoor. 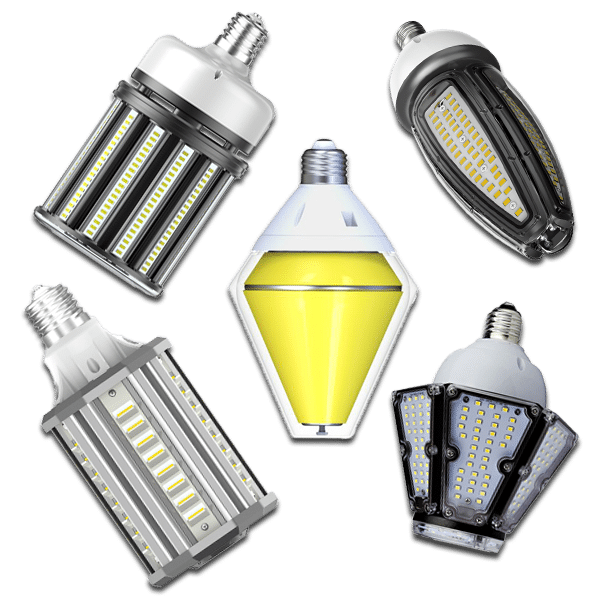 So our LED corn light can be used for Parking Lots,Post top lights,Street and Pathway Lights,Security Lighting,High Bay Fixtures,Wall Packs and Drop-Lights. You can choose from a variety of E27/E40 LED corn lights ranging from 10 watts to 140 watts and from 1200 to 210,000 lumens. And they can replace metal halide lamps,HPS and HID 100w,150w,200w,250w,400w and 500w. Our LED corn lights can save you up to 85% in energy usage compared to traditional lighting bulbs. Most of our LED corn lights has a lifespan of over 50,000 hours. This will meet the requirements to replace hard-to-reach bulbs in out-of-the-way locations. Our LED corn lights includes E40 LED corn bulb 30w-140w and E27 LED corn lights 10w-100w. It’s wise choice to convert traditional lighting into more energy efficient LED corn lighting, with all LED lights containing no mercury. For more information about our E27/E40 LED corn lights, or to order any of the LED corn lighting shown below, just contact us. Our LED lighting experts are waiting to communicate with you. As a leading LED corn bulb manufacturer, we will advise you on our best LED corn lights for sale to meet your needs. As an leading LED corn bulb supplier,we start to design and produce LED lighting since 1998. We have more than 10 series of E40/E27 LED corn lamp. Also you can choose different power of LED corn bulb from 10w to 140w. You can find what you needs here. We design all our indoor and outdoor LED corn lighting with Sumsung and Philips LED chips. This means our LED corn lamp has high lumens which is more than 150lm/w. Using our LED corn lights will help you and your clients to save more energy and money. If you are looking for E27/E40 LED corn light manufacturer, we are your best choice. We use high quality LED driver with our E40 LED corn lamp which has SPD protection. Also we use innovative cooling technology to transfer heat to air. This will ensure the LED corn lights with 50,000 life span. What is 50,000 hours? Ths means if you run one LED lamp for 6 hours per day, it would last for nearly 24 years. So you will never need to change another light for long period. As we know, inefficient incandescents and fluorescents contains mercury. Our LED corn lighting is safe, environmentally friendly and contains no toxic mercury. Our LED corn lights use 10%-40% energy to traditional lamps. What does this mean? Consuming less energy results in fewer greenhouse gas emissions being released into our environment. You can replace your HPS/HIP lamp with our LED corn lamp easily. All you need to do is just disconnect the ballast,then you can install the E40/E27 LED corn light. With our professional technical team, we design our LED corn lights with the most attactive appearance. LED lighting is the most gorgeous lighting. They can illuminate people and surroundings in color-rich light. Our E40 LED corn lights are designed to blend seamlessly with any architecture. Also,the proprietary diffusing lens and reflector system delivers an optimal light distribution. What kind of fixture is suitable with E40/E27 Led Corn Lights? You can use E40 LED Corn Lamp with nearly all kinds of screw-in sockets. Of course,you need to check the size of the LED corn light to check if it fit into the fixture. So you can use our LED Corn Light with these socket: E40,E27(Edison),E39(mogul),E26(medium) and EX39. How do I install LED Corn Light ? Our E40/E27 LED lamp is the fast and affordable solution to retrofit your fixtures ! AIS LED Corn Bulb can fit into most of the standard lighting fixtures. It offers a brighter and more energy efficient lighting solution. When you install the LED corn lights,please remember to bypass the ballast! It offers and effective solution to replace Metal Halide/HPS Low Bay Fixtures, Post Top Lamps, Parking Lot Light Fixtures, interior Sign lighting, and so on! This is one factor to make us to be a leading LED corn lights supplier in China. Surge Protection Devices (SPDs) are protection devices in electrical installation systems. They can prevent excess voltage appearing at the terminals of sensitive equipment. Any electronic equipment can be vulnerable to transient over-voltages, which can be caused by lightning activity or a switching event. This creates a voltage spike increasing the wave’s magnitude to potentially several thousand volts. Then it could cause instant damage or significantly reduce a piece of equipment’s lifespan. All our LED corn lights have SPD. This will ensure the safety when use our LED lighting. Also the SPD will make sure that our LED corn light can be used more than 50,000 hours. Where can I use the LED corn Bulbs ? What kinds of bulbs can led Corn light to replace? Which power should I choose if I want to relace CFL/HPS/HID with E40/E27 led Corn light? AIS LED corn lights use high lumens LED chips which can reach 160lm/w. Our 20W-30W LED corn lights can replace 60-100W compact fluorescent lamps (CFL),high pressure sodium (HPS) lights and metal halide lamps (HID). AIS 40w-50w LED corn lights can replace 100-200W compact fluorescent lamps (CFL),high pressure sodium (HPS) lights and metal halide lamps (HID). Our 60w-80w LED corn lights can replace 200-300W compact fluorescent lamps (CFL),high pressure sodium (HPS) lights and metal halide lamps (HID). AIS 90w-100w LED corn lights can replace 300-400W compact fluorescent lamps (CFL),high pressure sodium (HPS) lights and metal halide lamps (HID). Our 100-120w LED corn lights can replace 400-500W compact fluorescent lamps (CFL),high pressure sodium (HPS) lights and metal halide lamps (HID).